There are so many fun ornaments you can buy in the store, but a homemade holiday touch always makes things so much better in my opinion. When I was a child, my brother and I used to get an ornament every year that was just ours and I looked forward to placing each year's ornament on the tree in the following years. Sometimes those ornaments were handmade and I loved these ones since I could just feel the love put into them. When most people think of homemade ornaments, they think of a more crafty kind made with salt dough or Popsicle sticks, however, there are some really beautiful ones you can make right on your sewing machine! Here are 10 free ornament sewing patterns to inspire you this Christmas. These Scotty Dog Ornaments by Diary of a quilter are so cute and she did them with her kids, so they are a great project to do when the weather turns cold and your kids are bored. If you plan on giving gift cards this year, these Gift Card Holder Ornaments by Leaf & Letter are right up your alley. 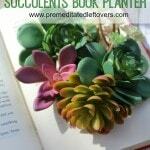 They look very simple to make and would be perfect to complete your gift! This Kitschy set of a Partridge and a Pear Tree ornaments from Let's Eat Grandpa are so adorable, aren't they? For an awesome way to use up leftover fabric scraps from other quilting or sewing projects, check out these Scrappy Stocking Christmas Ornaments from Stumbles and Stitches. Rust & Sunshine has the perfect ornaments you can make for your favorite sport fan! 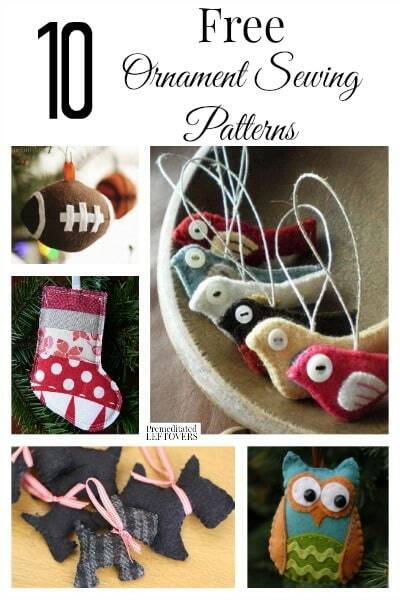 Check out these patterns for Football, Basketball and Baseball ornaments! For a fun felt ornament, check out these Teapot Ornaments from Living Crafts Blog. Juicy Bits has this awesome Owl Ornament that you can do. I just love the different color combinations she did on them. Does your family do the traditional German Christmas Pickle on your tree? This Christmas Pickle Ornament from While She Naps is so adorable and would be a perfect way to continue your tradition. Another great pattern from Stumbles & Stitches is this cute Little Birds one. 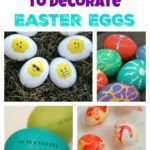 She made them into ornaments and a garland. Hugs and Stitches has a huge selection of vintage looking patterns for free on their site. You can get everything from snowmen to stars all free and available for download right away! As a bonus, I wanted to include this Free Tree Skirt pattern from Peek-a-Boo Pattern Shop. Whats a tree without one, right? Love to make Christmas ornaments! These r great.